We had seen beautiful yellow Aspen leaves, a great reflection of the surrounding rocks in the still water of Mills Lake, cold frost-covered grass and yet I knew there was still a great scene yet to come. As we rounded a corner on the trail above Mills Lake we finally saw it-the awesome, clean granite Northeast face of Spearhead beckoning us to climb it. 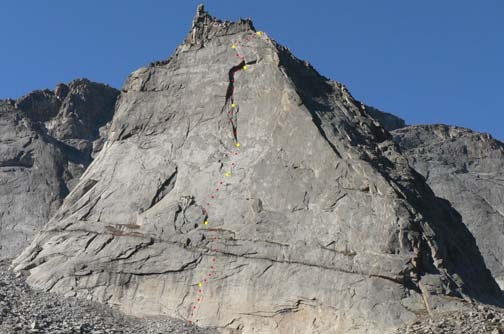 The Sykes Sickle route on Spearhead was to be our first technical alpine climb in the backcountry of Rocky Mountain National Park during our annual, two-week September climbing trip. We had read many reports on the climb and viewed numerous photos of the route and yet, as we stood there looking at it in person, our jaws dropped. The face looked so clean and inviting like the granite of the Sierra Nevada Mountains in California. Our plan was to hike in and bivy that night near the base of Spearhead and climb the route the next day. However, the weather was stellar and the face looked so appealing that we decided we'd climb it that day. We had left the trailhead around 7:00am and it was only 9:30am-we had plenty of time. We walked up to the base of the route which is very easy to locate and started racking up. On our rack we carried a selection of small to large nuts and BD camalots from .2 to 3 with doubles of the .4, .5, 1 and 2s along with 8 single-length runners and 4 double-length runners. We then had to decide who got the first pitch. We often have a hard time deciding who "gets to go first" so Bill has come up with a little game. He picks up a small rock in one hand and if I choose the hand with the rock, I get first lead. I picked the hand without the rock and therefore Bill got first lead. 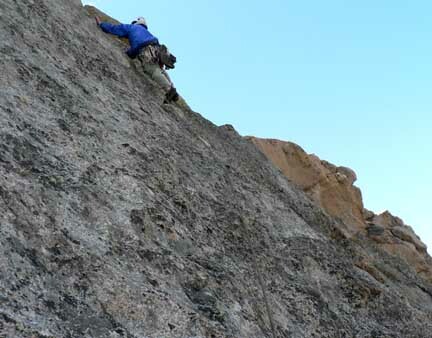 He said, "I don't know what that means in regards to leads the crux 5.10 roof pitch?" 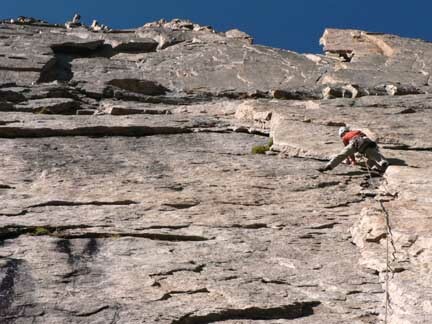 In my hasty researching of the pitches, I believed pitch 8 was the crux roof pitch and I nervously said, "It's pitch 8. I'll have to lead it," as I started mentally preparing myself for it. At 10:15am, Bill started up pitch 1 following a great lay-backing flake and appeared to really be enjoying the moves. Bill leads up the fabulous flake of the first pitch. As I belayed, I was excited just watching him climb the flake and couldn't wait for my turn! 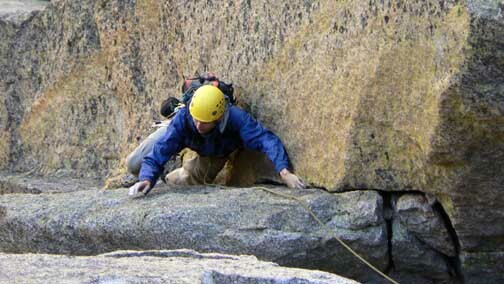 He reached a large bunch of slings at the top of the flake and setup a belay. I followed him up and enjoyed the very positive hands on the flake and great small features for feet. At the belay we both commented on how awesome that first pitch was. We would soon find out that this whole route is chock full of sweet flakes just like that! It doesn't get much better than that-awesome 5.7 granite flake climbing for over 6 pitches of climbing! I lead pitch 2 which is a very easy pitch that involved more scrambling than anything as I climbed through the grassy ledges of a major ledge system called "Middle Earth". At the top of the Middle Earth ledge I setup a belay and brought Bill on up. Looking up at pitches 3 and 4, the face looked less featured than what we had experienced to this point but it looked very appealing in a slabby, clean granite kind of way. Bill lead up on a major ledge to our left before venturing out onto the slabby moves on the face. The friction climbing was short lived though and before long he was leading up nicely protected, super fun flakes again. 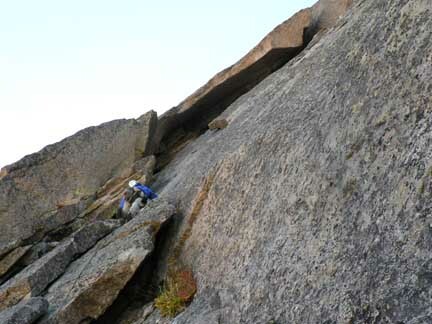 A view up the amazing granite of the third and fourth pitches. Through this pitch Bill didn't see anywhere that looked like a great belay area so once the rope came tight on me, I broke down my single-cam anchor (I was on a huge ledge!) 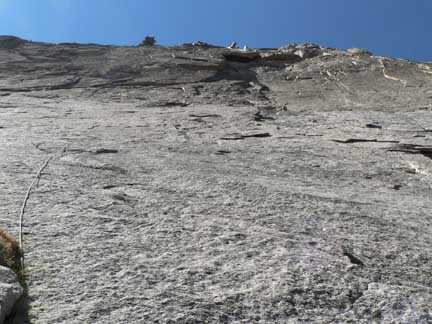 and began simul-climbing for nearly another full pitch. 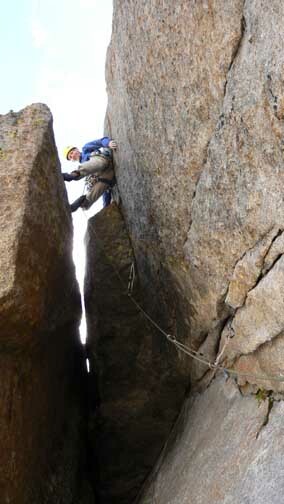 As we simul-climbed I laughed to myself fully expecting that now Bill would have to lead the crux pitch! When I arrived at the top of what would be pitch 4, I thanked Bill for simul-climbing those two pitches together so that he would end up leading the crux pitch. He said, "Damn it!" and I laughed as I started leading up pitch 5. Pitch 5 started out with an awesome, gently-sloped right-facing corner before ending up some wonderfully positive and steep flakes. At one section I moved left across some thin face moves to transfer from one fantastic flake to another. The flake was thin enough that it felt like a handrail guiding me on up. 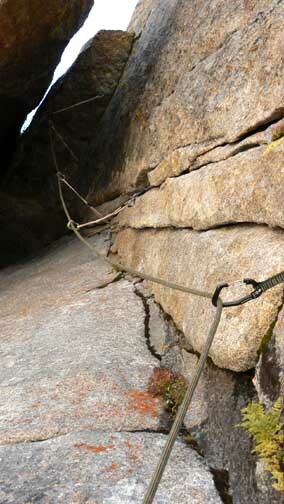 I stopped in a large trough next to a bunch of slings on horn and setup the belay to bring Bill up. Up until this pitch we had been climbing in the sun on warm rock. However we were now nearing the sickle and this rock had been and was currently in the shade. The temperature difference was very noticeable. When Bill arrived at the belay we both donned our jackets before noticing something-the next pitch, pitch 6, would easily take us to the belay just below the roof. This meant I would, in fact, end up with the crux pitch and the joke was on me! I said, "Damn!" In secret though, I was actually looking forward to leading the roof as the wide stemming moves sounded right up my alley! We laughed as we thought of the table-turning irony of events that would end up with me leading the crux pitch and Bill was now very satisfied that he had simul-climbed pitches 3 and 4. Bill led up pitch 6 which, despite being cold, was a lot of fun. Near the end of the pitch the face he was climbing turned blank but nice features could be seen down lower. So Bill placed some gear high and then moved down to make the nicely thin traverse from one crack to another. Very smooth! Looking up the sixth pitch into the darkness of the sickle. Once he reached the obvious belay just below the big roof at the top of the sickle, he setup an anchor and brought me on up. Having spent a fair amount of time in the shade I was now chilled and stopped to warm hands a couple of times while seconding the pitch. These stops were also part of my ploy to delay the inevitable-leading through the roof. I consider myself a solid 5.9 trad leader with the skills and head to lead harder trad routes but don't often do so. The roof move was rated 5.10 but supposedly protected well so I wasn't too worried. If I had to hang on gear, so be it but I was confident I'd get through it. Seconding the cooler sixth pitch in the Sickle. At the belay, we scoped the roof. We could see three pitons in the crack up to the roof, one piton at the start of the roof and two fixed nuts in the middle of the roof. There was also potential to get in a .4 cam in the crack on the way to the roof. It looked highly protectable! I started up on lead and clipped the first piton. A few feet further up the thin finger crack I placed a .4 cam in the crack and moved up. After that I was able to get my left foot over to a small foot placement and get comfortable to reach up and clip the next piton. After one more short move up, I was able to stem across the walls and moved my sling up from the last piton to the next piton. So far so good. I stemmed up a bit more and was able to clip both fixed nuts with one carabiner as they were so close together. I felt very good about the amount of protection so far and, in fact, as I stemmed up more, I started to get twisted around in the slings because there were so many! I untangled my arm and head from the sling that was clipped to the two nuts and then moved so that my two feet were against the left wall and my back was against the right wall. I commented to Bill that these moves were very disorientating and more awkward than difficult! We had carried a number 3 camalot because it had been mentioned in other reports that this roof could be protected with a 3 or 4 camalot. With all the fixed gear, I didn't feel the need to place the 3. I inched my way up back first, feet following until I could reach the super positive edge of the left wall at the top of the roof. Once my hands were on that edge, I knew I had it! I pulled myself up and out of the roof onto the nice flaking ledge that continued up the face. What a blast! The roof moves, while awkward, offered a great challenge of fun, different moves. Enjoying a comfortable stance just after pulling through the roof out of the sickle. Plenty of protection leading through the roof!. A loose quarter-inch bolt just above the roof on the flake was my next bit of protection before I cruised up the fun ledge to a belay at a small bunch of chokestones in the flake. I knew the next pitch was supposed to be some 5.7 traversing out right on friction moves and this place looked like it was next to that. I was glad I saved my number 3 cam as it came in handy, along with a number 2, for the belay. I yelled to Bill that I was off belay and setup to belay him through the roof. I knew he had the backpack and his approach shoes clipped on his harness so I was expecting the roof to give him a hard time. However, with only a little bit of grunting, he made quick time through the roof and I soon saw him coming up along the flake ledge to the belay. We swapped gear and he started looking for the bolt that supposedly protects the friction face. As he stood up from the belay and moved onto the face, he spotted the bolt only a few moves away and, after a bit of hesitation that inevitably accompanies the commitment to friction holds, moved through to clip the bolt. Bill leading out onto the face of pitch 8 just right of the belay. A few more friction moves were made up and right and eventually the climbing eased and Bill reached the north ridge at 2:15pm. I could see he was in the sun and was anxious to join him. I moved efficiently through the friction moves and reached the ridge quickly where we unroped and scrambled to the summit for some photos and awesome views of the west side of Long's Peak. After enjoying the summit for a bit we hiked back down to our gear and enjoyed some cheese, pepperoni and crackers before hiking down the third class gullies on the west side of Spearhead. While descending we ended up going much further left than we had expected as the gullies on the right ended in cliffs. A decent climber's trail leads the way down. In short order we were back at our packs at the base of the route and were pleasantly surprised to discover that no marmots had managed to get to our packs since we hung them from a runner on a flake about 15 feet up from the talus and scree. We hiked over to near Green Lake and found a nice flat, rocky bivy site for the evening. We were both so pumped up about the awesome quality of the rock on Spearhead that we discussed the plan to climb on Spearhead again the next day on a route called "The Barb". A nearly full moon that night cast a great white light on Spearhead to give us a nice view to fall asleep to. Written by Jason Halladay on 08 September 2006 for TheMountainInstitute.com.